The Arria® 10 SoC SoM provides to developers the best Out-Of-The box experience combining the Best-In Class compact hardware platform and the most efficient intuitive software environment. 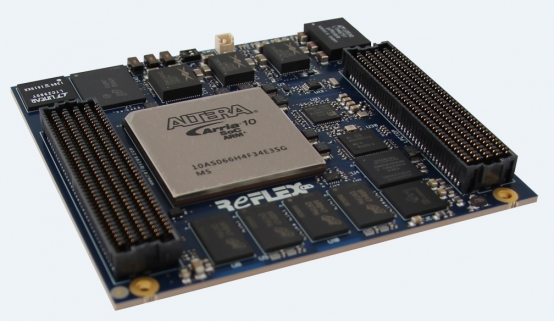 Featuring an ARM dual-core Cortex-A9 MPCore and up to 660KLEs of advanced low-power FPGA logic elements, the Arria® 10 SoC combines the flexibility and ease of programming of a CPU with the configurability and parallel processing power of an FPGA. The target markets are as wide as Automotive, Video Broadcast, Machine and Intelligent Vision, Industrial, Military, Test & Measurement and Medical. 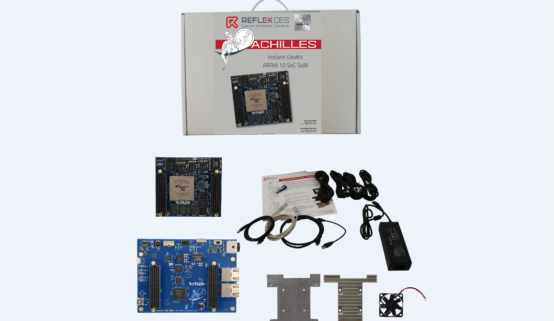 This System On Module is also available in a Development Kit :The Achilles DevKit. We also offer a PCIe Carrier Board as an optional extra product compatible with any of REFLEX CES Arria® 10 SoC SOM's, or can propose the design of a custom Carrier Board. Discover a quick video about our Achilles Workshop ! Ultra compact form factor at only 86x95 mm (3.4x3.8 inches) is ideal for area constrained applications. Careful board layout enables superior signal integrity, support for multi-Gigabit serial protocols, including PCIe Gen3 and 10G Ethernet. 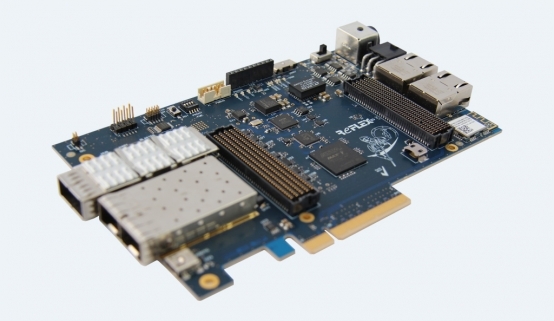 Achilles Instant-DevKit is comprised of the Arria 10 SoC SoM plus a Starter board for quick prototyping and application testing. Comprehensive reference designs available enable out-of-the-box experience, designs provided with source code. Standard Linux Debian support, allows seamless porting of existing application software. 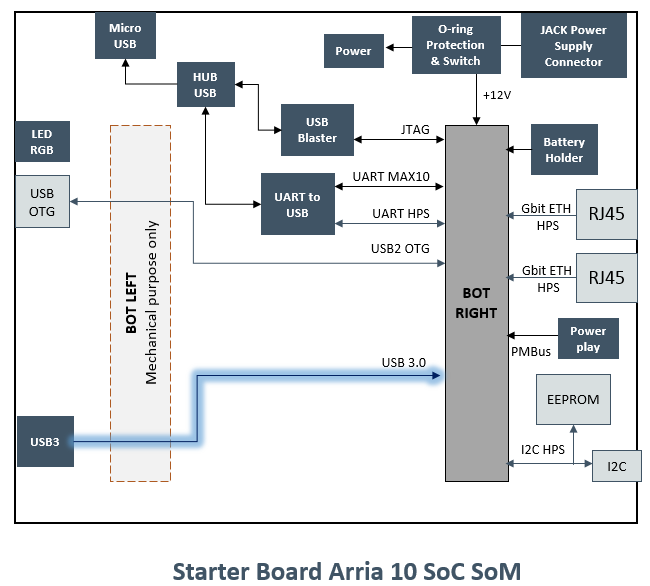 In addition of the Arria® 10 SoC SoM you can order the PCIe Carrier Board. On board USB Blaster JTAG configuration circuitry to enable FPGA configuration over USB connector. One µUSB connector allows interfacing UART bus and communicate with the MAX 10 and the HPS FPGA. Atmel Wifi 802.11 b/g/n IoT (Internet of Things) module which is specifically optimized for low power IoT applications. Module provides SPI and SDIO to interface to host controller. * There are four FMC connectors , but the two mirror connectors (Top and Botom on each side) share the same signals, the use of these two connector sis exclusive, one of the two connectors can be used at a time.